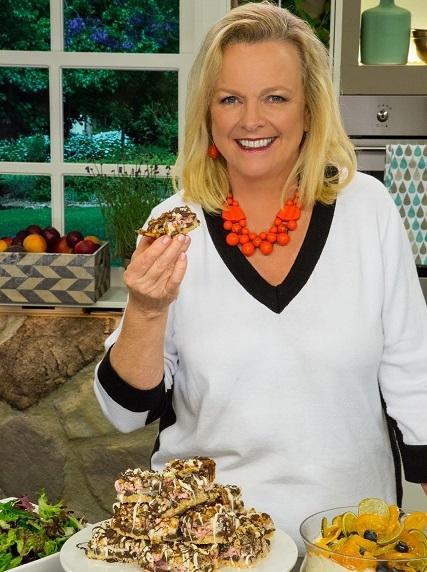 Australian food and cooking show personality, Lyndey Milan, will be returning to TV on Sundays at noon on Channel 7 from 14th February 2016 with Lyndey Milan’s Summer Baking Secrets. The new TV series will run for six weeks and coincides with the release of Lyndey’s bakeware range. In her new TV series, the ‘Home Cook Hero’ will show viewers how baked goods that look superb, can easily be re-created at home. Packed with recipes that reflect the Australian summer, Lyndey Milan’s Summer Baking Secrets, will include baking secrets, time-saving tips, and Lyndey’s personal insights. To coincide with Summer Baking Secrets, Lyndey will release her first-ever storage and bakeware range, the culmination of 30 year’s experience and a two-year collaboration with Margaret Butler, founder of Anasazi. The competitively priced Lyndey Milan Bakeware Range will be released at the end of February 2016 and includes modern cream ceramic-coated tinware, new-age silicone bakeware, clever double seal storage containers with Lyndey’s signature hot-pink accents, baking accessories, innovative kitchen utensils and food preparation products. Every piece is dishwasher safe, the silicone non-stick and the utensils have eco friendly, sustainably sourced bamboo handles. For more than three decades Lyndey Milan has been shaping the Australian and international culinary scene with her contributions to magazines, cookbooks and TV appearances. Her latest cookbook, Lyndey Milan’s Taste of Australia won best TV Chef Cookbook at the 2015 Gourmand World Cookbook awards and her TV series Lyndey & Blair’s Taste of Greece, has just been named winner of Best TV Series in Australia for the 2016 awards and will be judged against the world’s best in China later this year. Also known as the Home Cook Hero, Lyndey Milan is Creative Director of Flame Media, an international TV production and distribution company, and Sydney Studio Kitchen, purpose built for filming culinary and other content.